Brookhaven Academy, in Mississippi, is a “non-sectarian school based on Christian principles” with a footbridge spanning a stream in its “outdoor classroom” and an impressive carved wooden cougar greeting visitors at its front door. The dining hall serves rib sandwiches and hushpuppies; parents purchase school uniforms from Land’s End. Tuition stands at a little under $5,000 a year. This is where Cindy Hyde Smith, who is currently favored to win Tuesday’s Senate runoff election, sends her daughter, according to the Jackson Free Press. There is one black student currently enrolled at the school, which is in Lincoln County, a county that’s about 30 percent black. This is by design: Brookhaven was, like the high school Hyde-Smith herself graduated from in 1977, founded specifically to extend segregation, using private money and private means, after Brown v. Board of Education desegregated public schools in 1954. Cindy Hyde-Smith is the first woman to represent Mississippi in Congress, though she’s held various political offices since the late 1990s. Until eight years ago, the longtime conservative served as a Democrat: rather than a political party, it appears her strongest allegiance is to the motifs and token myths that symbolize the Confederacy and its “Lost Cause.” As has been widely reported in the weeks leading up to tomorrow’s special election (in which she faces the Democrat Mike Epsy, whose election would make him the first black senator to represent the state since Reconstruction), Smith has a habit of making public statements that are less dog-whistles than barely coded screams. 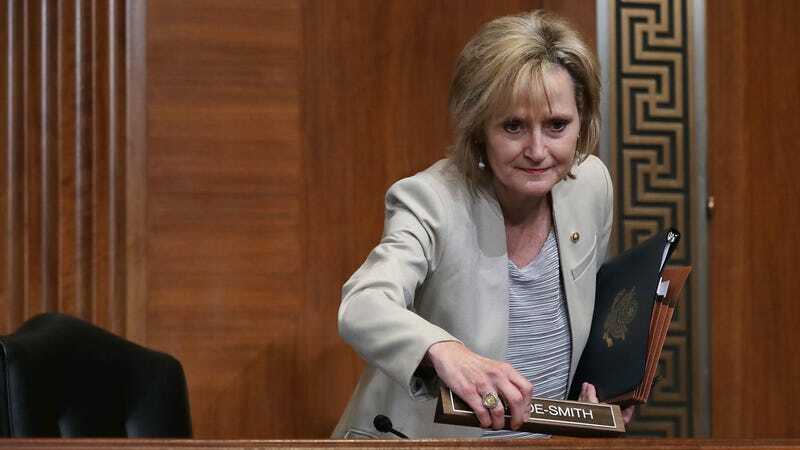 In the last decade, Hyde Smith has co-sponsored a resolution to recognize the last living “Real Daughter” of a Confederate solider in Mississippi and praised Confederate soldiers for “defending their homeland.” She has publicly honored the “Dixie Alliance,” a group that, according to the Jackson Free Press, believes that the “South was right to exercise its moral and legal grounds to declare independence.” She has posed holding a rifle and wearing a Confederate cap (“Mississippi history is the best!” reads the caption on the photo circulated online) and most recently, invoked the idea of a “public hanging” to a rancher who attended her campaign events. Hyde-Smith did not immediately return a request for comment, but her public apologies for these incidents have remained tepid: the whole lynching reference is just an “exaggerated expression of regard,” she has said. This is just the way things are in Hyde Smith’s world. But that world of hers is also, coincidentally, as the Jackson Free Press first reported, a world constructed by white people to overstep the federal government and enshrine the values of the pre-Reconstruction South. In a time where totems of the Confederacy are explained as respect for one’s ancestors or a kind of proud Southern tic, these segregation academies remain as reminders of these very real institutions—still present today—created by white people as a means of racist terror and out of pure spite. Segregation academies, obliquely called “freedom of choice” schools by their proponents, differ from the otherwise still-segregated American school system in that they were founded expressly to keep white kids away from black ones. Left largely to their own devices, they’re scattered across the country and are mostly, though not exclusively, concentrated in the South. In Mississippi, by 1971, they educated about 40,000 white children. Now at least 35 former segregation academies still accept students in the state. The earliest segregation academies were founded by white parents in anticipation of the Brown v. Board of Education ruling, which only applied to institutions controlled by the state. In many cases, planning started immediately, and such schools rushed to find space between the ‘60s and ‘70s. Between 1961 and 1971, enrollment in non-Catholic Christian schools doubled. Many private schools catering to the white exodus from from public schools opened as Evangelical programs or preached Christian values, as Brookhaven, Hyde-Smith’s daughter’s school, does. By 1969, there were more than 200 such schools across the South. When school started back up in January, he attended one of the academy’s new satellite campuses in a Baptist church. The situation was far from ideal: Study halls sometimes were interrupted by weekday funerals. Yet not a single white student showed up at [local high school] Gentry that semester. In the spring, Rosenthal received his diploma as part of the academy’s first graduating class. According to the Atlantic the majority of white teenagers in the town of Indianola attended the academy as of 2012. When the magazine queried the Indianola’s headmaster about its racial make-up, he promised “we also have Hispanic, Indian, and Oriental students.” A few years later, this statement is difficult to fact-check or update: the school’s demographics do not show up in a database kept by the National Center for Education Statistics. (The school did not immediately respond to request for comment on this point.) Generally better-funded than most local options and largely exempt from oversight or state scrutiny, the internal mechanisms of former segregation academies are often opaque. In 1969, a group of black parents sued the Treasury Department over three tax-exempt K-12 all-white private schools in Mississippi, alleging that their fundamental discrimination should disqualify them from tax-exempt status. In January of 1970, they won the case: concurrently, the federal government cracked down on the practice nation-wide. Some schools shut down rather than allow black students; many others bet (it turns out correctly) on less hard-line institutional forms of segregation, which would deter black kids from applying or gaining admittance to their schools. Lawrence County Academy, where Hyde-Smith herself attended school, closed in 1980. According to the Jackson Free Press, she likely attended school elsewhere before transferring in. A yearbook photo obtained by the publication shows a cheerleader, a few heads down from Hyde-Smith, dressed as a Confederate soldier and holding a flag. Hyde-Smith rests her head on her chin, eyes fixed on the camera. She looks very at home.